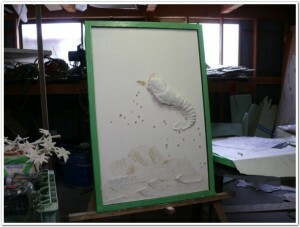 I got Five color lobster from fisherman who lives in Kamae Oita. Mr.Zingo wants some sample of Japanese Lobster. So, I asked one of my friend who is fisherman. His father got the Five Color lobster 30 years ago. It was rare to catch without any scars. 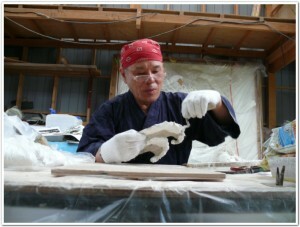 Mr.Zingo started to make wave part of plaster art. Above picture, bottom part will be the waves.